This Strawberry Barbeque Dessert Recipe makes an easy Grilled Fruit Dessert idea for your dinner or party. Make this delicious and summery dessert on the grill, and keep your kitchen cool! Grilling strawberries and peaches adds a caramel flavour to the fruit as the natural sugars caramelize when the fruits are heated on the barbeque grill. Wow your family and friends with this unique summer dessert! Note - A tropical variation of this recipe would be to use pineapple and banana garnished with toasted coconut, or apples and pears garnished with cinnamon added to the whipped cream. Use your imagination and create your own specialties! Be sure grill is clean and oiled, (**scroll down for a great oil spray refillable container idea). Grill peaches and strawberries until tender, and beginning to turn brown, with some grill marks showing. Strawberries will take about 4 - 5 minutes, remove the berries and turn the peaches over and grill for another 4 - 5 minutes. Allow fruit to cool, and then remove the peel from the peaches. Cut the fruit into about 1/2" cubes, and combine the grilled peaches and strawberries in a large bowl. Stir the liquid honey in with the fruit in the bowl, and allow mixture to cool. In a large bowl, using an electric mixer, beat the whipping cream, powdered sugar and the vanilla until soft peaks form. In tall, clear serving glasses, assemble the dessert, arranging the barbequed fruit and whipped cream in layers, starting with mixed fruit, then whipped cream spooned over top, and repeat layers until glass is filled. Or, fold the cooled fruit into the whipped cream, and spoon the mixture into the tall glasses. 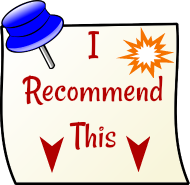 ~ This recipe has been adapted from a recipe in my local newspaper, The Hamilton Spectator. 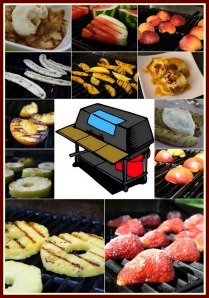 **I love using my oil sprayer (refillable spray container) when grilling fruit. It also works great for adding an oil mist to leafy green salads! Click on the image below for more detailed product information, available for online purchase at *Amazon.